The Maryland Department of the Environment (MDE) has contracted with the University of Maryland, through the Center for Integrative Environmental Research, to conduct an independent study of the economic and energy impacts related to Maryland’s potential participation in the Regional Greenhouse Gas Initiative (RGGI). On April 6, 2006, Maryland Governor Robert Ehrlich signed into law the Maryland Healthy Air Act, which had been passed with large majorities in Maryland’s General Assembly. The purpose of the law is to improve air quality in Maryland by requiring power plants in the state to reduce a variety of emissions, including sulfur dioxide, nitrogen oxides, and mercury. In addition, the law requires the six largest power plants in the state to reduce emissions of carbon dioxide, a significant greenhouse gas. Production of electric power is vital to the State of Maryland but greenhouse gases, such as carbon dioxide that are a byproduct of this production represent a significant negative externality. It is important to carefully balance the gains from inexpensive and reliable electricity with programs to mitigate the negative environmental effects of these gases. To this end, the Maryland Healthy Air Act (Senate Bill 154) was recently passed. This bill requires the State to become a full participant in the Regional Greenhouse Gas Initiative (RGGI) no later than June 30, 2007. RGGI currently comprises seven Northeastern and Mid-Atlantic states that in December 2005 entered into a memorandum of understanding to develop and implement a carbon dioxide emissions trading program for electric generators located within their states. The trading program would begin in January 2009. Co-Principal Investigator (Phase 1): Dr. Steven Gabriel, Associate Professor, Department of Civil and Environmental Engineering and Center for Integrative Environmental Research. To review Stakeholder Comments and the Stakeholder Input Process please visit the stakeholder archive. -- Electric rates for residents of the State. -- Availability of credits among participating states. The analysis of the aforementioned items is a complex task which necessarily involves experts in energy, the environment, economics, and modeling. To this end, the University of Maryland’s Center for Integrative Environmental Research (CIER) has assembled a talented team of researchers and industry experts. CIER will have overall responsibility for the project making sure that the issues mentioned above are carefully analyzed and reported in a clear and comprehensive way. Project Modeling Researchers from Johns Hopkins University (JHU) and Resources for the Future (RFF) will be partnering with the University of Maryland as subcontractors, and will be applying their expertise in the modeling of the electric power grid as well as the resulting environmental impacts. In particular, both JHU and RFF will be using existing models -- Oligopolistic Power Market Model (JHU) and Haiku Model (RFF) -- that can directly answer questions such as adequacy of the energy supply, generator competitiveness, electricity rates, and reliability issues in addition to providing some summary economic measures such as producer and consumer surplus. These models have already been applied in different contexts to address energy sector issues in Maryland. In addition, the University of Maryland itself will draw upon its expertise in electric power and environmental issues. 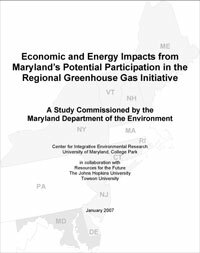 In terms of the economic effects, Towson University’s (TU) RESI will be brought in to use their input-output model to measure the economic welfare impact of RGGI participation on the State of Maryland. View details on each modeling approach by clicking here.